Pseudocode requires that you write down the steps needed to accomplish a task. a. 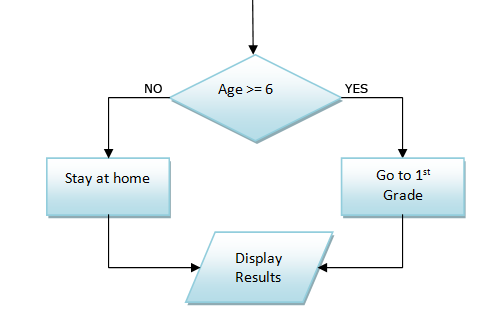 A flow chart is similar to pseudocode but a graphic representation. c. In sequence structure, one step follows another unconditionally. d. In decision structure, alternative courses of action are chosen based on a Boolean value. a. The condition must appear within parentheses. d. You can use the relational operators to compare the values of primitive data types, but cannot use <,>,<=, or >= to compare objects. The equal == or != (not equal) can be used with objects but it references only the object’s memory address not it values. == only yields true for two objects when they refer to the same object in memory, not when they are different objects with the same value. a. Correct blocking is crucial to achieving valid output in if statements. It is perfectly legal to place curly braces around a single statement. b. Remember any variable you declare in a block is local to that block. bonus=MEDIUM_BONUS: //pay close attention to else statements so that they are nested correctly. && is an operator. When using && a complete Boolean expression is needed on each side. a. Short-circuit evaluation determines whether both side are true. c. || is the or operator. d. If the first test is false then the second one will be evaluated. e. A range check is a series of statements that determines a set of ranges within which a value falls. 6. Using the switch statement is useful when you need to test a single variable against a series of exact integer (int,byte,short), character, or string values. a. Switch starts the structure and is followed immediately by a test expression enclosed in parentheses. b. Case is followed by one of the possible values for the test expression and a semicolon. c. Break optionally terminates a switch structure at the end of each case. d. Default optionally is used prior to any action that should occur if the test variable does not match a case. System.out.println("Sophomore"); //will be executed from that point forward. //with any statement after the closing burly brace of the switch. case 3: //Code does not have to be written for each case value. f. It is most efficient to list the most common case first, instead of the case with the lowest value. Switch will execute only the true case or default if the break statement is included. g. The ability to test strings is new in this version of JAVA. h. The same results from switch can be achieved by using nested if statements. 7. Using the Conditional and Not operators. b. An advantage to using the conditional operator is the conciseness of the statement. c. Using the not operator. Use ! to negate the results of any Boolean expression. Any expression that evaluates as true becomes false when preceded by the not operator, and any false statement becomes true if preceded by the ! operator. 8. Operator Precedence: in JAVA. d. Remember the () is used to override precedence. Additionally, parentheses can be helpful in making your program more understandable. False= stay home true= goto 1st grade.